San Antonio, Texas Affordable Dentures & Implants offers several styles of full dentures, each with special features and advantages. It’s part of our mission to put transformation within reach. See below for more details, or call us at 210-570-9694 if you have a question about a particular style. 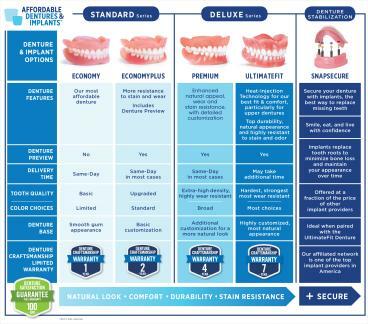 Affordable Dentures® offers San Antonio, TX, dentures at an affordable price so that people of all budgets can afford to have the smiles that they deserve. Our dental plates are crafted on-site by our team of technicians. We provide natural-looking full sets, upper sets and lower sets and even offer denture-retention implants. When you need San Antonio, TX, dentures, consider coming to Affordable Dentures. We offer convenient locations and hours and a wide range of dental solutions. Let us help improve your life with a more confident smile by visiting our office today. 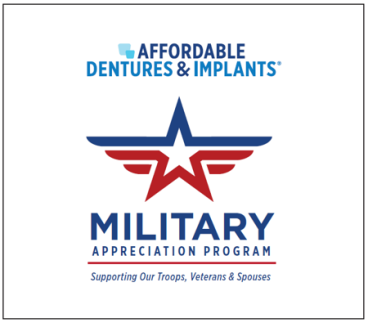 Active duty military, veterans and their spouses enjoy a 10% discount on all services at this practice location. It's our way of saluting your service and thank you for keeping us safe. Simply bring your military ID or proof of service (or spouse's ID or proof of service) with you to redeem your 10% discount. George A. Tanksley Jr., DMD, is a general dentist and the practice owner of this Affordable Dentures-affiliated practice in San Antonio, TX. The practice opened on November 7, 2013. Dr. Tanksley and his staff look forward to fulfilling the denture needs of patients who travel from Hondo, Pearsall, Pleasanton, Floresville, Uvalde, Crystal City, and surrounding communities. Dr. Tanksley earned his Doctor of Dental Medicine degree from Rutgers School of Dental Medicine. Based on many years of valuable dental experience, Dr. Christiansen and his staff are proud to offer professional, compassionate care to patients that visit this practice. Please fill out the form below to request an appointment. For immediate assistance, please call us at 210-570-9694. These are minimal fees and charges may increase depending on the treatment required. All dentures are individually made for each patient. *Routine Extraction fee shown above is with purchase of New Denture Wearer Package. Regular routine extraction fee is $95.